Now it’s easy to hide those items if you are an owner, admin or editor in a stream. When you roll over a stream item, you’ll see a small eye icon with the label “hide” next to it in the lower right corner of every item card. Click it and the item will disappear from view. As stream creator/admin/editor, these items will remain available to you, should you decide to unhide one. 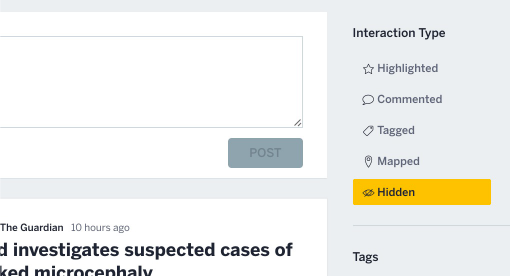 Look under "Activity" in the right-hand sidebar, "Hidden" is the last item in the list. But these items will not be visible to other viewers. If you want show an item that has been hidden, click on the “hidden” category, look for the item that you wish to show, roll over it and click on the “Unhide” option that becomes visible in the same upper right position that the “Hide” option appears in items that are visible.